TESS reports that North Lanarkshire’s literacy strategy is continuing to make significant gains for all pupils, but particularly the least able, an evaluation published last week has shown. ‘A group reading assessment of P3 children showed that those who had been taught by the “active literacy” methodology were significantly ahead of those taught using more traditional methods, thus maintaining the progress observed in the first phase of the programme. I reflected on my work with a P.1 pupil who had cognitive difficulties. Her barriers to learning were compounded by social and emotional deprivation and her family had difficulty in providing an environment to offset some of the disadvantages she was born with. Unfortunately working and learning with parents is time consuming and costly. Leadbeater says that we may have exhausted other avenues for further development in education except in “Personalisation and collaboration.” A redistribution of resourcing and flexibility of provision might reach pupils currently missed. TESS (3/10/08), reporting on several speakers at the Learning Festival says the emphasis needs to be on “Relationships”. Martin Rouse called on schools to focus on “relationships,respect and recognition” while Professor Teese said that Scotland should be strengthening relationships within its schools. The BBC reports that many schoolchildren could be failing reading and writing tests because they are unaware they are dyslexic, new government-funded research suggests. A study by Hull University academics of 1,300 children said dyslexia was a major cause of failure. Over half of those who did not achieve expected levels in SATS tests displayed all the signs of being dyslexic. The research has led to calls for more specially-trained teachers in schools as well as better diagnosis. The Guardian reports that according to a research study schools are not identifying children at risk, says the research, which reveals that 2 million children have dyslexic-type learning difficulties, more than has previously been thought but in line with research in the US. Only 76,000 children have been recorded as having a learning difficulty and dyslexia groups said it showed that too few pupils are getting specialist teaching. The research, based on screening 1,341 pupils and funded by the Department for Children, Schools and Families, suggests that 20% are at risk of a learning difficulty including dyslexia. It found that 55% of pupils who are failing Sats are at risk of dyslexia or learning difficulties. Separate research by the National Union of Teachers last year revealed that the majority of state schoolteachers lack confidence to identify and teach dyslexic pupils. Fewer than one in 14 said they would be “very confident” in identifying a child with dyslexia. 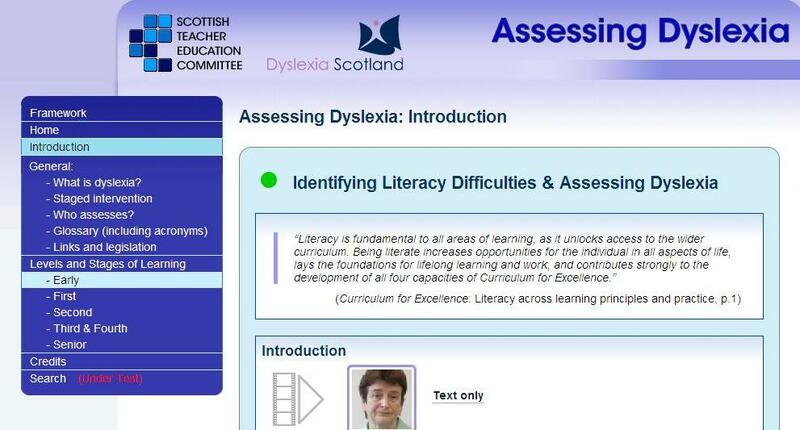 Comment from the Dyslexia Support Service in East Lothian: I’d be curious to hear whether class teaching colleagues in our authority identify with this research from England. And if so, what can we do about it?